Boucicault's four-act play "AFTER DARK : a Drama of London Life" was an authorized adaptation of Adolphe Dennery's 1854 play "Les oiseaux de proie". The play has much in common with W. T. Moncrieff's "Scamps of London", itself an adaptation of Dennery and Eugène Grangé's "Les Bohémiens de Paris". 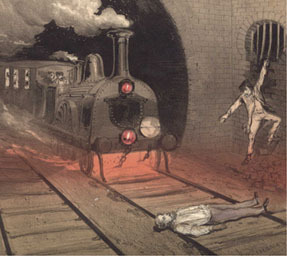 However, the most important instance of unoriginality in relation to this play is Boucicault's plagiarism of the sensation scene from Augustin Daly's melodrama "Under the Gaslight" (1867), in which a character is placed across a railroad track and rescued at the last moment from an oncoming train. "After Dark" was first performed at the Princess's Theatre, London, August 12, 1868. Seven years before the action of the play is set, Chandos Bellingham seduced the wife of his fellow army officer Frank Dalton; Fanny Dalton eloped with him, taking her daughter, Eliza, with her. Bellingham was transported to Australia for a felony, leaving Dalton's wife to die in the workhouse. Meanwhile, Eliza was brought up by Bellingham's associate, the gambling-house keeper Dicey Morris. Dalton, broken by his wife's infidelity, turned to drink and now haunts the streets of London as "Old Tom". Eliza is now married to the somewhat unprincipled George Medhurst, who has forged his father's name on a document, and is in the hands of Morris, who has teamed up again with Bellingham. Dicey and Bellingham learn that Medhurst is heir to a baronetcy and a fortune, on condition that he marry his cousin, Rose Egerton. They intend to bring this marriage about and then blackmail Medhurst for half his inheritance; for this purpose, Eliza must disappear. When Eliza learns that Medhurst is willing to desert her, she decides to commit suicide. Meanwhile, Captain Gordon Chumley, who is helping Rose Egerton in her search for Medhurst, has recognized Old Tom as his former army comrade Frank Dalton. During an interview with him, he learns that Bellingham, whom he has met in Australia, is the man who has wronged Dalton. Eliza, having jumped off Blackfriars Bridge, is saved by a group of tramps, including Old Tom. Eventually Eliza and Tom discover they are father and daughter. Tom asks Chumley to find a situation for Eliza, and Chumley decides to recommend her as a maid to Rose Egerton, who - in spite of the mutual love between herself and Chumley - is about to get married to George Medhurst. Meanwhile, Morris and Bellingham are tightening the thumbscrews on Medhurst. He confesses his situation to Chumley, who promises to help him, disclosing in turn his own love for Rose. In the meantime, Eliza, who has arrived to work as Rose's maid, learns the identity of Rose's fiancé. George, believing Eliza dead, decides to confess his previous marriage to Rose, but mistakes his wife for his fiancée. Rose overhears the confession. Chumley confronts Bellingham with his knowledge of his criminal past and promises his silence in return for Medhurst's forgery. They arrange to meet at one of Morris's gambling halls. During this meeting Chumley is drugged by Bellingham and Morris and placed across the rails in a tunnel of the London underground. In the climactic moment of the play, Old Tom, who has been imprisoned by the villains in a nearby cellar, breaks through the wall and saves Chumley in the nick of time from an oncoming train. In the denouement, Morris and Bellingham are taken by the police, Old Tom feels he now deserves to be called father by Eliza, and Eliza has been acknowledged as Lady Medhurst. Rose and Chumley are free to marry.